Join us once again for Jersey 'Prov II - This time it's personal! ONE night of Improv. TWO great shows! Brought to you by Suburban Legend and Rocket Improv! Tickets are $10. Family friendly. Tickets are $15. May contain adult language and situations. OR you can get tickets for both shows at the special price of only $20! Teenage FBI is New Jersey’s ONLY all teen improv troupe. Which may or may not be true. But probably is. The fact is these young humans ROCK! They’ll prove it to you by performing some musical improv tonight. Yup, you heard that right. They’ll make stuff up that goes beyond just thinking up lines and will be creating lyrics and freakin’ music on the spot! Full disclosure… their autographs are really the only things they’ve rehearsed. 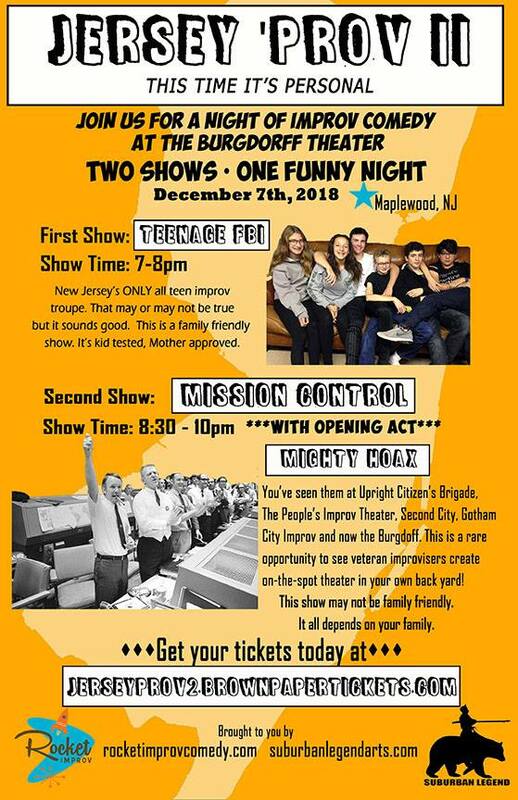 Mission Control consists of a mix of some of New Jersey’s hottest improvisers from improv institutions such as IO Chicago, The Peoples Improv Theater, Second City, and Gotham City Improv. This is a rare opportunity to see veteran improvisers create on-the-spot theater in your own backyard! Cast consists of Rocket Improv instructors Lulu French (Gotham City Improv), Abby Sher (Second City), Dave Maulbeck (the Magnet), Angela Dohrmann (the PIT), and Brad Barton (Gotham City Improv) with guests Bob Kulhan (IO Chicago) and Kimberley Hellem (IO Chicago). This show may not be family friendly. It depends on your family. What do you get when you combine a therapist, a corrections officer, a scientist, a graphic designer, and a commercial specialist? Sounds like a Mighty Hoax to me! This troupe might be new, but they are not afraid to get weird and conjure up a few laughs along the way. When you combine Mehdi Doumi, Jonny Fido, Justin Kemps, Tim Lowe, and Eric Shepperd you are guaranteed to see something truly unique. You are guaranteed a Mighty Hoax!